Using phones while driving is dangerous and should stop. But the focus on this issue distracts us from other dangers in driving (which have — you’d never believe from the news — declined rapidly in recent decades). And it distracts us from the broader danger of relying on motor vehicle transportation. I dwell on this subject because it offers lessons beyond its substantive importance (see all the posts under the texting tag). Today’s lesson is about conflicts of interest in the news media. 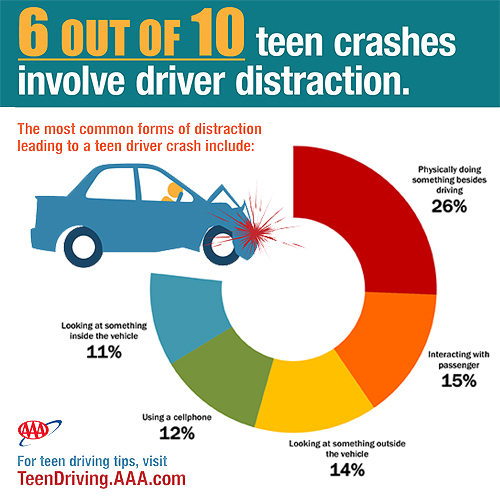 The AAA Foundation for Traffic Safety published a study of about 1,700 moderate or severe car crashes in which people ages 16-19 were driving. To identify possible causes of the crashes, they used cameras and motion sensors in the cars, and analyzed the seconds before each crash. The headline result probably should have been that 79% of the crashes occurred when teens were driving too fast. But that’s apparently not news, so the AAAFTS and all the news media reporting the story focused on the fact that 59% of the crashes showed distraction as a likely cause. So I redid the categories. I don’t see why eating and drinking should be a separate category from grooming, or why singing/dancing should be separate from adjusting the radio. So I made a new category called “physically doing something besides driving,” which includes eating or drinking, using an electronic device (besides phone), grooming, reaching for an object, smoking-related activity, operating vehicle controls, and singing/dancing to music. Also, for some reason their figure lists “looking at something outside the vehicle” but only includes “attending to unknown outside vehicle” in that category. I added two other types of distraction to that category, “attending to another vehicle” and “attending to person outside” — bumping up the outside distraction substantially. The New York Times reporter Matt Richtel won a Pulitzer Prize for his reporting on distracted driving. And he published a book — A Deadly Wandering — that tells the tragic story of a driver who killed someone while he was texting. Unfortunately, he is prone to hyping the problem of texting, which his audience is unfortunately prone to fixating on. I previously pointed out that, on the website promoting his book, his publisher uses an extremely wrong statistic, claiming that texting “continues to claim 11 teen lives per day.” He has mentioned this statistic (or its variant, that texting kills more teens than drunk driving) on Twitter, and also in media appearances. I pointed out that this number is more than all the teens killed in motor vehicle accidents, so it’s obviously baloney. I emailed Richtel about this, and he told me he would “get it fixed.” I emailed the publisher. I emailed the Times. I emailed the Diane Rehm show. No one changed anything. Cellphone crashes are like child abuse: people will believe any statistic about how bad it is and attack anyone who’s skeptical. Of course I don’t want to minimize the problem of distracted driving, and there’s nothing wrong with telling people it’s dangerous. And it’s not my area of expertise. So I’ve only given the issue a few hours. But playing into a public hysteria about a very narrow, behaviorally-driven problem, rather than exposing the systemic problem that it reflects, is not good. Memo to parents: Distracted driving by teenagers is riskier than previously thought, particularly when it comes to multitasking with a cellphone. Some people who are tired of me complaining about this think you can’t have too much hype about safe driving, so who cares? But the distraction matters. The evidence that phones are a fundamental cause — a social cause — of accidents and deaths is very weak, although they are certainly the proximate cause in many cases. But we don’t have randomized controlled trials to test the effects of phones. I suspect the people crashing while futzing with their phones are mostly the same people who would be crashing for some other reason if cellphones didn’t exist. When I look at the video compilation the AAA put out to accompany their report — which mostly shows teens crashing while using their phones — I am struck by what terrible drivers they are. They look down for three seconds and drive straight off the road without noticing. In contrast, I routinely see people driving on the freeway completely absorbed in their phones — driving obnoxiously slowly but using their peripheral vision to keep going straight. They are at grave risk of an accident if something crosses their path or traffic stops, but they’re not veering all over the road. Their slow speed probably mitigates their risk of crashing. I AM NOT RECOMMENDING THIS, I’m just saying: bad drivers cause accidents, and if you give them a phone they’ll use it to cause an accident. 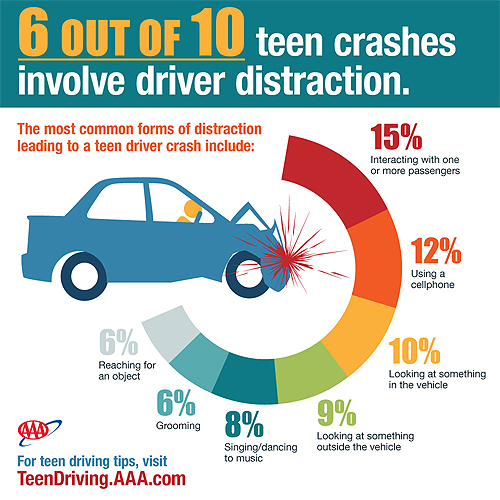 Did you know teen driving fatalities have fallen by more than half in the last decade? 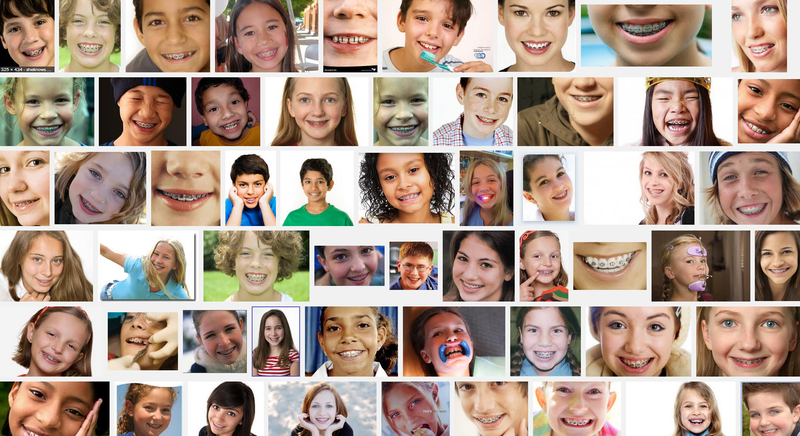 (During that time incidentally, teen suicides have risen 45%.) Did you know that, from 1994 to 2011, mobile phone subscriptions increased more than 1200% while the number of traffic fatalities per mile driven fell 36% (and property-damage-only accidents per mile fell 31%)? Don’t count on Matt Richtel to tell you about this. And yet, of course, thousands of people die in car accidents every year in the U.S. — at rates higher than the vast majority of other rich countries. But as long as people drive, there will be bad drivers. If we really cared, we would replace individual cars with mass transit (or self-driving cars) — putting transport in the hands of computers and professionals. Nothing’s perfect, of course, but preventing car accidents isn’t rocket science, and blaming a systemic problem on the individual behavior of predictably error-prone drivers doesn’t seem likely to help. The other day I argued that focus on the “texting-white-driving epidemic” diverts attention from the dangers of driving generally. Here’s a different direction. The contemporary fascination with using data to tell stories runs up against the need to tell stories in the length of a tweet or in one chart, sometimes resulting in data-focused news that uninforms people rather than informing them. 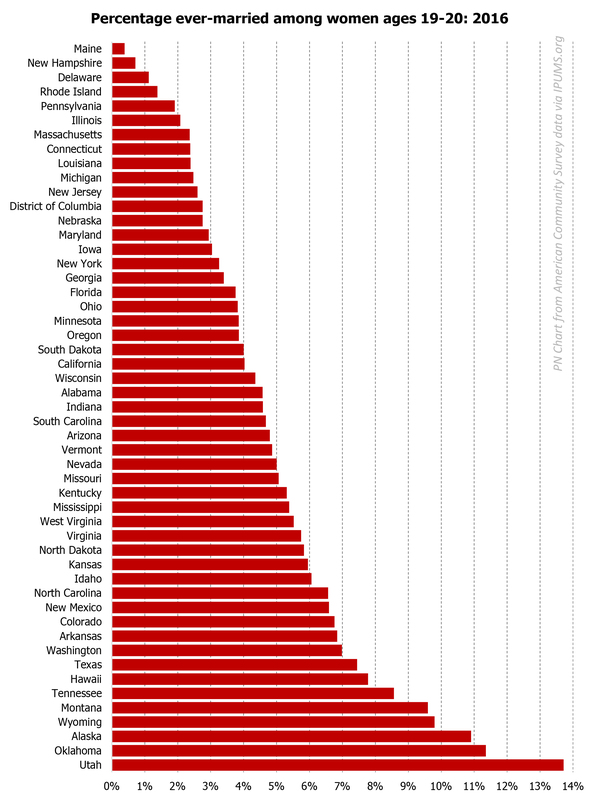 So, I may not be able to tell the whole teen car death story in one chart, but I can show that you can’t reduce the whole teen car death story to a texting epidemic in one chart (source). Incidentally, there is a possible clue in that Pediatrics article as to why accident rates aren’t rising due to all this texting. The teens who text while driving are much more likely to engage in other risky behaviors: driving drunk, riding with drunk drivers, and not wearing seatbelts. 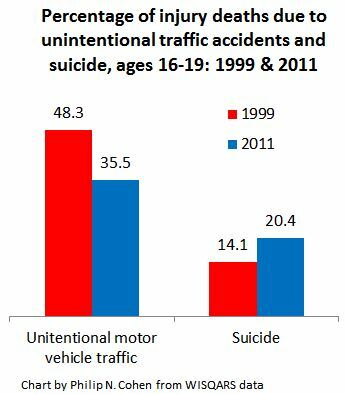 So texting deaths may to some extent be displacing deaths those same teens would have caused in other ways. Follow this series of posts at the texting tag. *Thank linked paper argues that texting is contributing to the increase in distracted driving deaths, based on cellphone subscription rates and texts sent per month. It’s plausible but not entirely convincing, because I have doubts about the measure of distracted driving deaths (which rely on local police reports, fluctuate wildly, and include lots of labels, including “carelessness”). 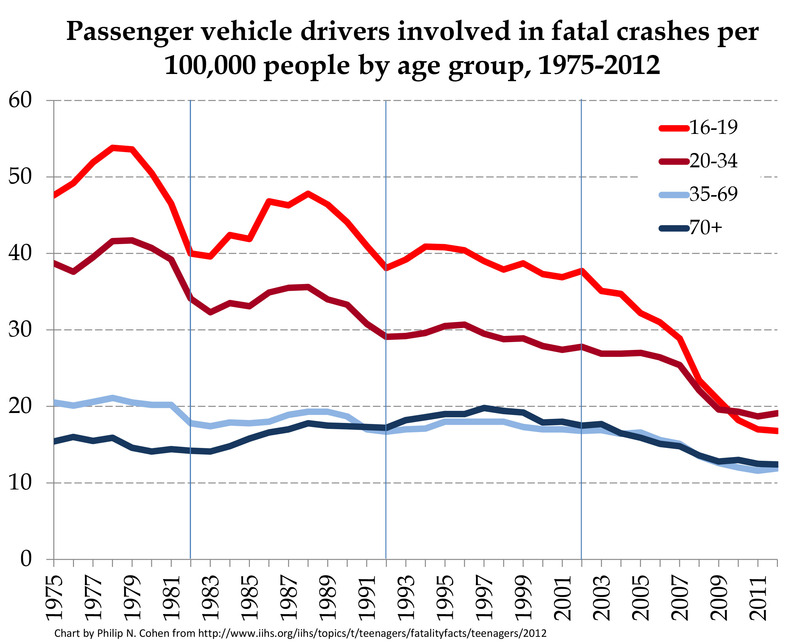 They don’t analyze the trend in total traffic deaths. **This fact may be the source of the myth that 11 teens die from texting and driving every day (less than 8 die daily from all motor vehicle accidents), because someone got carried away by lab studies showing texting while driving was as dangerous as drinking and driving and just extrapolated. Even in our post-apocalypse world, births and marriages are still related, somehow. 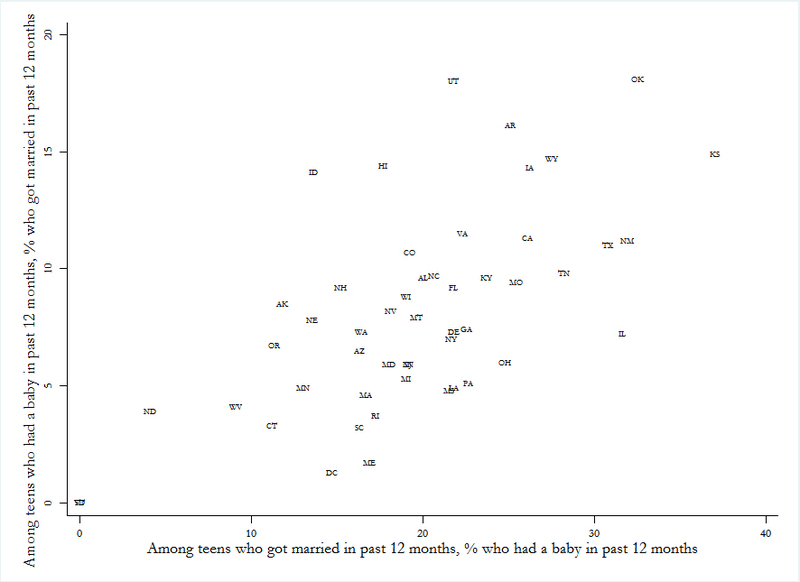 Some teenage women get married, and some have babies. Are they the same women? First the relationship between the two across states, then a puzzle. The teen birth rate ranges from a low of 1.2 percent in New Hampshire to 4.4 percent in New Mexico. 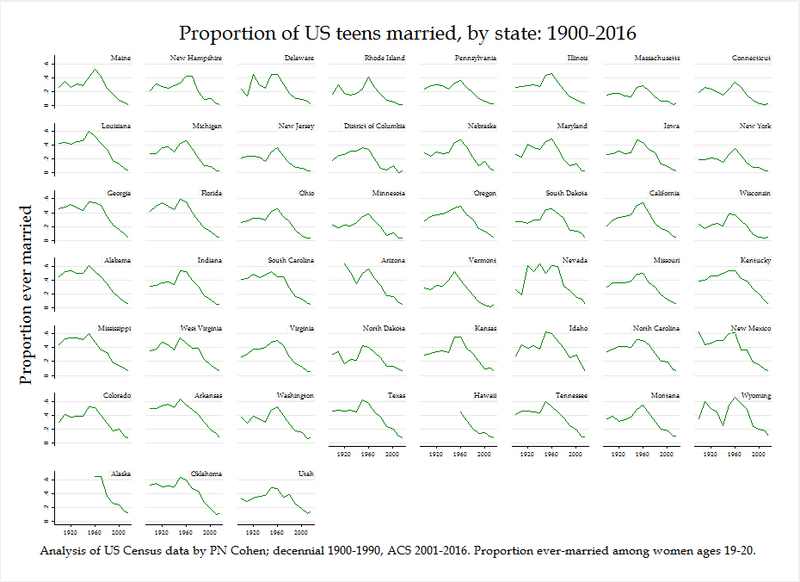 The teen marriage rate ranges from .13 percent in Vermont to 2.3 percent in Idaho. But how much of these weddings are “shotgun weddings” — those where the marriage takes place after the pregnancy begins? 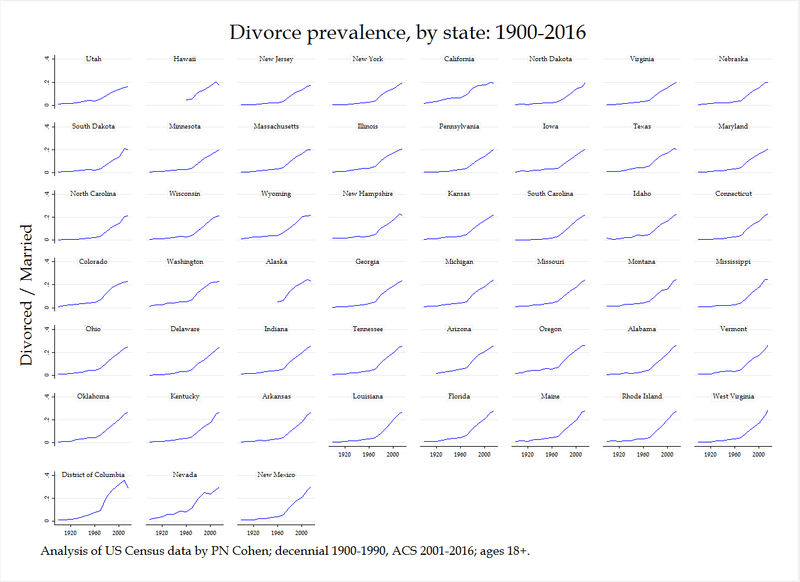 And how many of these births are “gungo-ho marriages” — those where the pregnancy follows immediately after the marriage? (OK, I made that term up.) The ACS, which is wonderful for having these questions, is somewhat maddening in not nailing down the timing more precisely. “In the past 12 months” is all you get. Here is the relationship between two ratios. 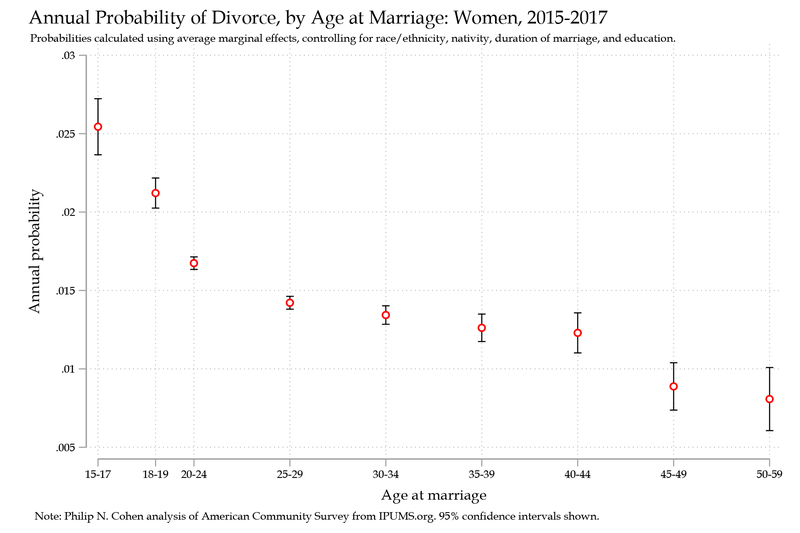 The x-axis is percentage of teens who got married who also had a birth (birth/marriage). 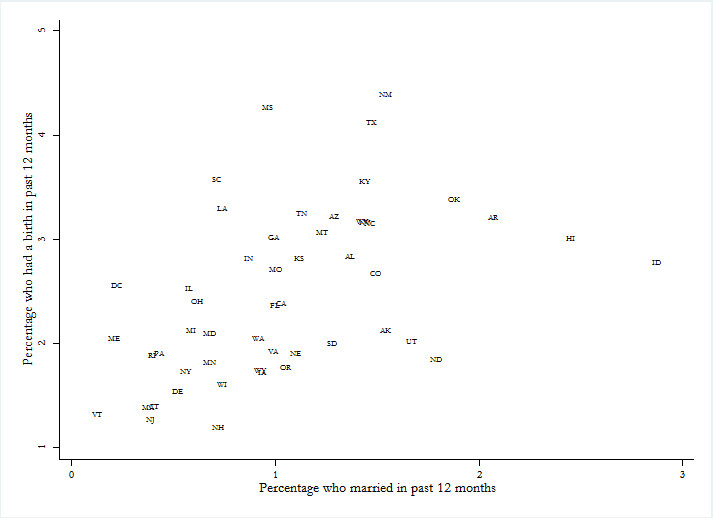 On the y-axis is the percent of teens who had a birth who also got married (marriage/birth). 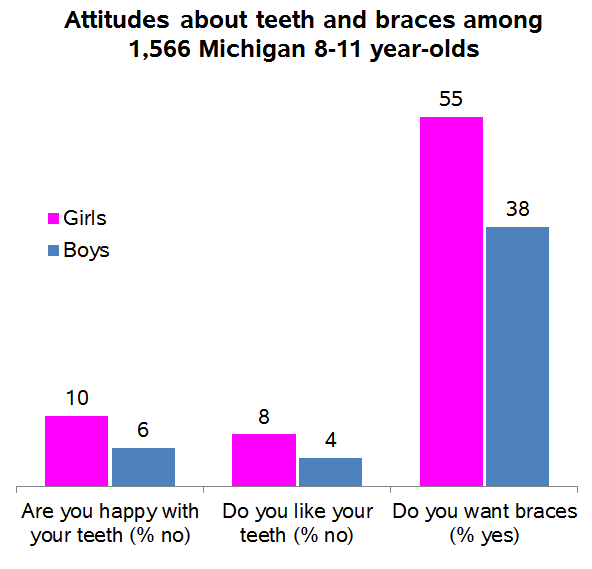 If you can figure out how to interpret these numbers, and the difference between them within states, please post your answer in the comments.